They're also loaded with nutrition so you can feel good about serving them anytime. They're simple enough for every day, but perfect for gifting and special occasions too. Seriously, I'm so excited to share these chocolate truffles with you all. They are so sooo delicious – even my “I don't like chocolate” hubby was swooning over them. They are a super easy dessert so you can pull it together quickly to bless your family, someone you love, or just make an indulgence for yourself. Because treating yourself every once in awhile is a good thing. I have 3 truffle recipes on my blog already. But they clearly weren't enough. One can never have too many truffles, I say. First of all, truffles are typically chocolate, which is something we all can agree is a good thing. 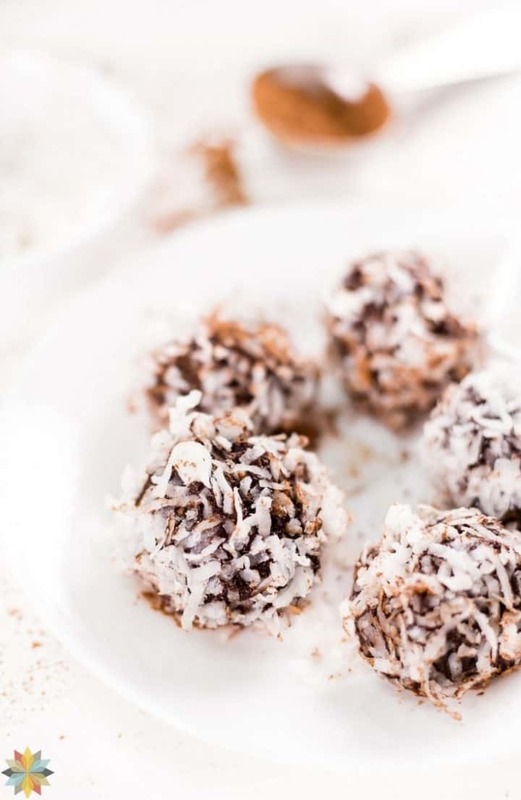 Second, they are an easy no-bake dessert so they come together in a flash – perfect when you're in a hurry and in the warmer summer months when the thought of turning on the oven is a bit daunting, . When you can add “healthy” to the above benefits, we have a real winner. I used to make chocolate truffles every year as a Christmas gift for friends and loved ones. Those were loaded with expensive chocolate bars, heavy cream and white sugar. Alas. They were incredible, but since candida has become a household word around here there's not going to be any of those around any time soon. 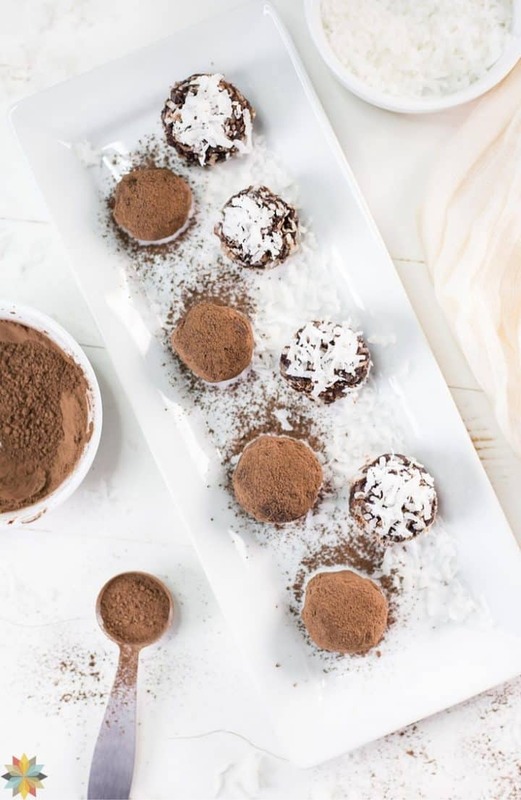 These chocolate avocado truffles are loaded with the healthy goodness of plain cocoa, avocado, coconut butter, and a low carb sweetener. Sigh – this much deliciousness with a bunch of health thrown in? I dare say that these give the cream and white sugar laden truffles a real run for their money. How good? Let me tell you – my husband is NOT a fan of chocolate. It gives him a headache sometimes and he typically passes it up. But he sure didn't turn down these morsels of yumminess. These. Are. Good. I mean real good. – anti-cancer benefits – improves inflammatory and oxidative stress levels. This resource has more on all of the above points. 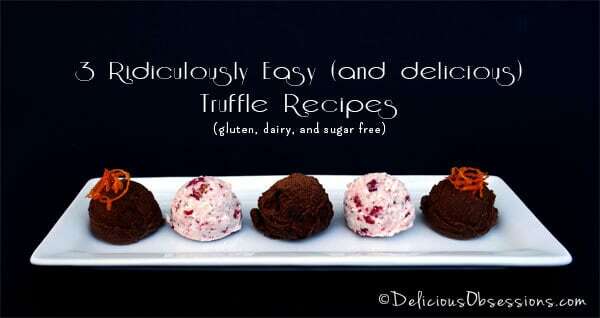 I think you'll find it to be fascinating reading and will surely inspire you to whip up some of these truffles asap. I must say, I will feel especially good about getting my next big bag of avocados at Costco the next time I am there :). 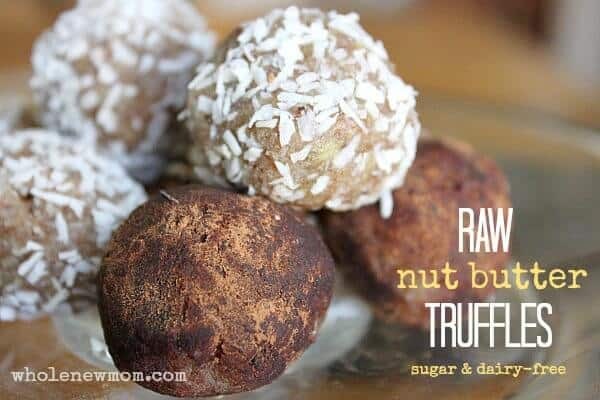 Regardless of whether or not cocoa is super good for you or not, these truffles are way healthier than most other dessert you could make. 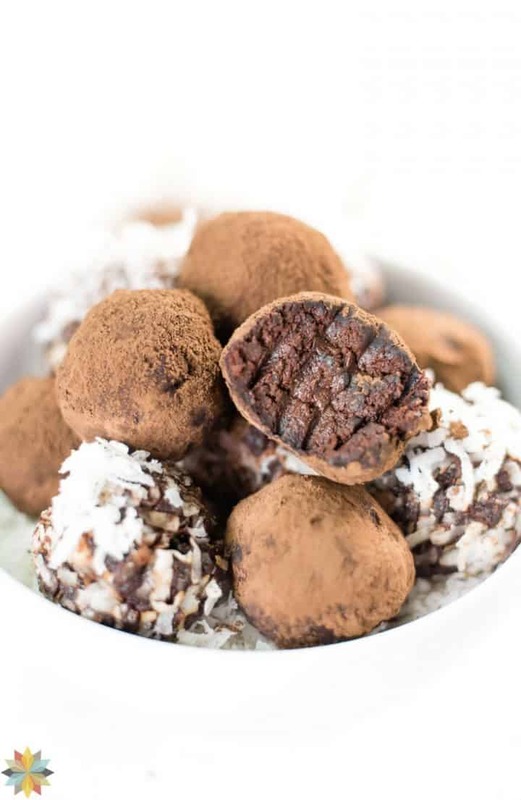 And if you use stevia in these chocolate avocado truffles, you are getting a nutritional boost there as well. I touched on some of that in this post–Is Stevia a Danger to Your Health? The Truth Comes Out. You won't need to convince anyone to gobble down a few of these to boost their health. That will come naturally :). In fact, I bet you will love these so much that you will either want to make a bunch and freeze them for later, or alternatively you can stock up on avocados when they are on sale and take advantage of my tips for freezing avocados. You're welcome. Cookie Scoop or Melon Baller. Of course, you can just use a spoon and roll the balls in your palms. Cocoa: One thing to keep in mind is that cocoa powders vary in quality and strength. Please do taste the recipe prior to forming the truffles to make sure that they taste amazing. If not, you might have to adjust the cocoa or sweetener. More cocoa is (almost) always a good thing :). Coconut Butter: If you would like to make your own coconut butter, see my Homemade Coconut Butter. Carob: You can use organic carob instead of cocoa for a caffeine-free and AIP alternative. Sweetener: You can use 4 to 5 drops liquid stevia instead of stevia extract (here’s how to make your own liquid stevia) – see more about How to Use Stevia here. Alternatively, use approx. 6 Tbsp of your sweetener of choice. If AIP, you may wish to avoid stevia. Toppings: Options for toppings include cocoa powder (use carob for AIP), crushed nuts or seeds (soaked and dried) (omit for AIP), and organic shredded coconut. 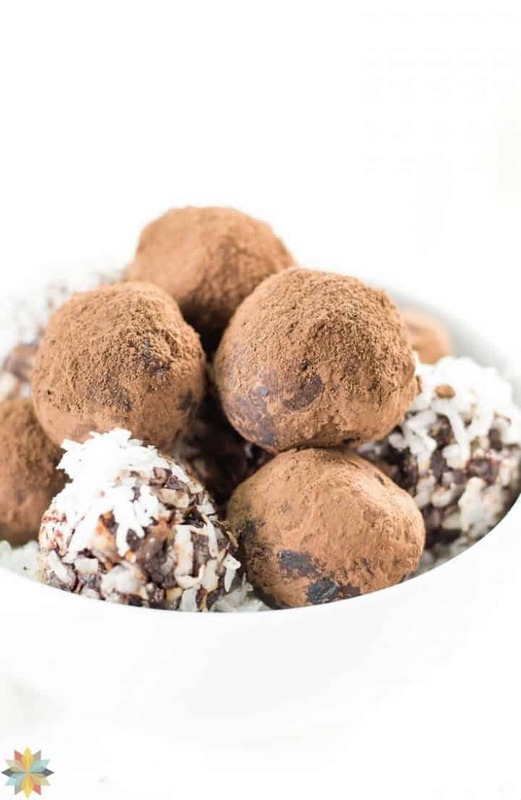 One reader shared the amazing idea of rolling the truffles in coconut flakes toasted with maple syrup and a combination of freeze dried blueberry and raspberry powder. 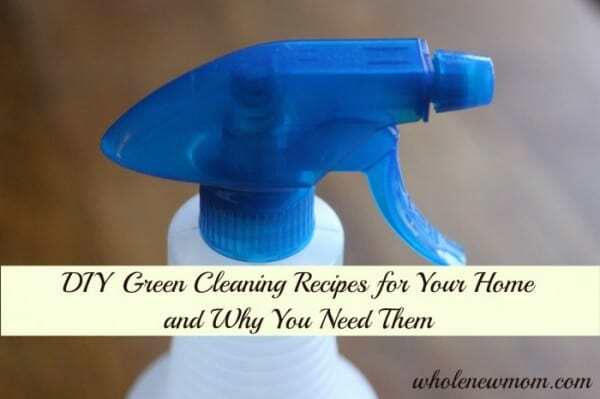 THM: This recipe fits in as an “S” on the Trim Healthy Mama plan. A homemade alternative to powdered coconut sugar is my Powdered Sugar Substitute. For a low-carb option, use powdered xylitol in the same proportion as the coconut sugar, or ¼ cup powdered organic erythritol. Here's a short video to show you just how EASY and really FUN these delectable truffles are to make! 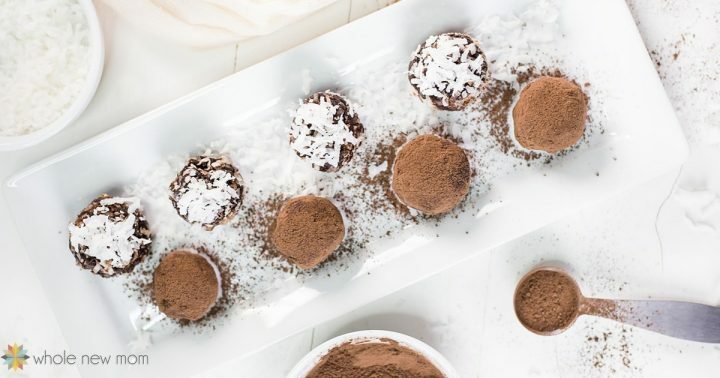 This paleo & vegan easy healthy chocolate avocado truffle recipe is sure to become a favorite in your home. Warning - they are quite addictive! Place in a bowl in the refrigerator until fairly firm (approx. 40 min), or alternatively use the freezer for 10-20 minutes. Using a small cookie scoop or melon baller, scoop out balls of the avocado mixture and roll into balls. Roll the balls into desired topping. Refrigerate or freeze any remaining truffles for later. For a low-carb option, use powdered xylitol instead of coconut sugar, or substitute ¼ cup powdered organic erythritol. Really – these are just so simple to make. I recommended this recipe to a friend who wanted to make a special treat for a friend of hers who suffers from many food allergies. 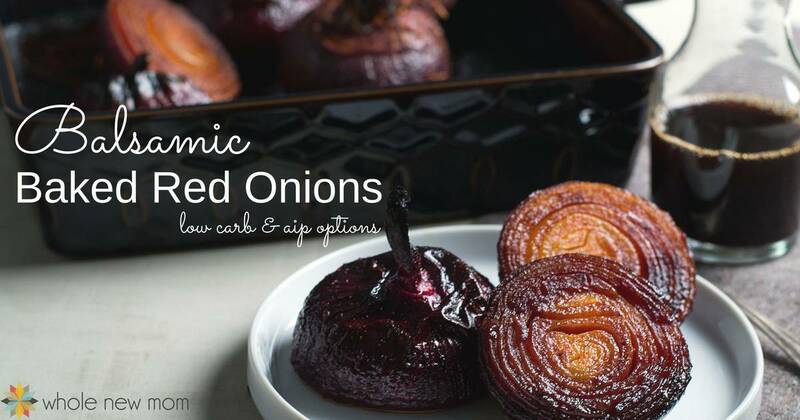 She made these (and LOVED them, by the way), and said that she will DEFINITELY be making them a lot more now that she knows how simple (and delish) they are! I really had to work hard to not eat the whole batch of these truffles myself. I'm watching my chocolate / caffeine intake due to adrenal fatigue, but boy were these calling my name all day. 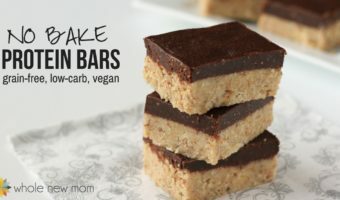 I think these will be a frequent addition to our healthy snack menu in our home for sure (maybe made with carob next time), but I might need a lock on the refrigerator door :-). 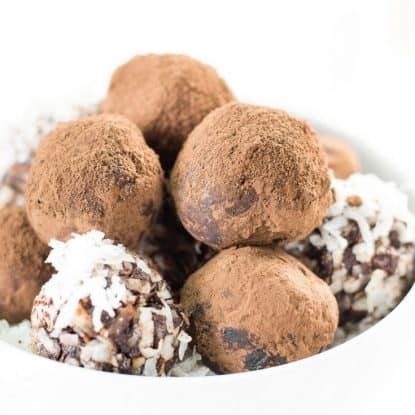 Will you make these chocolate avocado truffles for yourself — or gift them? I have been making vegan fudge with smart balance or similar for a decade. This is a treasured recipe among my friends. So, I was sincerely skeptical about coconut butter… but I LOVE coconut. So, I gave it a go… NAILED IT! thanks for saving us all from margarine. Cheers! YEA!!!!! Thanks for coming back to share!!! I’m thinking either straight nut or seed butter or 1/2 nut or seed butter combined with melted cocoa butter perhaps? Does the avocado get brown after making these? How long do they last? I’ve always had to use lemon to keep my avocados fresh. The truffles are really dark b/c of the chocolate. I don’t know about how long they would last but I wouldn’t leave them at room temp and maybe not too long in the fridge. They would freeze well for sure! Can you you cocoa butter instead of coconut butter. I live overseas and can’t get the coconut butter. You could but it will be a harder truffle. Did you see you can make your own coconut butter? https://wholenewmom.com/whole-new-budget/make-your-own-coconut-butter/ Does that help? Any other substitute? I don’t have a strong enough machine to make my own. I can buy coconut cream here, what if I whip that longer would that work? I don’t think so but perhaps you could simmer it to reduce the moisture content out since it is just coconut and water I think.